Whether or not you want to BYOP or purchase your pumpkin there, it doesn't matter. 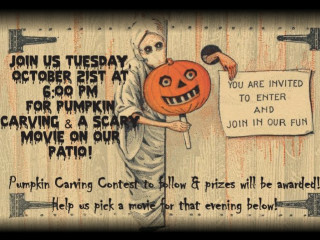 But you can't miss pumpkin carving on the Black Sheep Lodge patio while watching one of your favorite scary movies that you can vote for. Pick which movie you'd like to watch on their Facebook event page. Contenders include: Scream, Dawn of the Dead, Zombieland, and more.